erry Imdieke, the local roofer, who will be putting the metal for the new roof on the barn, stopped by today because he had a window in his schedule, and took off the ‘beak’ of the barn and the overhang with a sawzall. My mom and dad and I spent the evening cleaning up the debris. The building looks bald without it’s trim-boards and beak, but I think it will look better when the new metal trim is on. Deshingling is just around the corner, Dom and I will start as soon as his spring semester ends on May 12th. 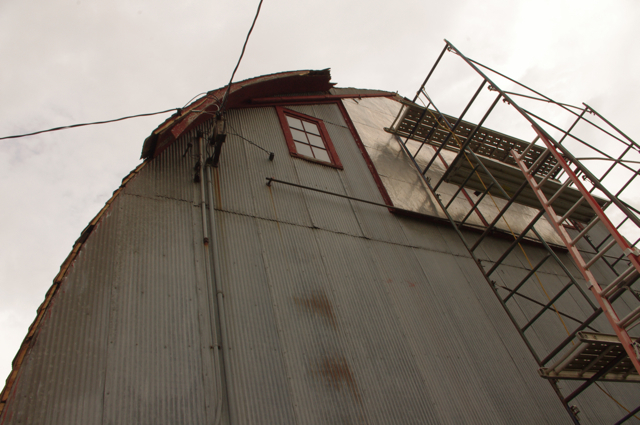 I am excited to get the building stabilized with a new roof.